Stephanie is an outspoken Jewish voice for Palestinian rights and humanity, and is one of the nation's leading Jewish experts on anti-pinkwashing organizing. She has fervently sought to break down the stereotypes of Muslims and Arabs being homophobic, and of queer and trans spaces being Islamophobic, all while forcing discussions in Jewish spaces about silence on racism, Islamophobia, and complicity in genocide. Stephanie offers several talks on Palestine solidarity topics, available for viewing below! Pinkwashing, the attempt to cover up the human rights abuses of the Israeli State by pointing to it's liberal record on LGBTQ rights, is a hot-button topic of discussion in queer and trans spaces across the country. From the Chicago Dyke March, to college campuses around the country, there are as many debates as about pinkwashing as there are pieces of misinformation about the issue. Pride With Prejudice, a nationally-recognized comprehensive curriculum on pinkwashing, seeks to cut through the noise and deliver an informative, engaging, and activating workshop on pinkwashing, its major tropes, pinkwashing organizations, and how to take action to prevent queer and trans bodies to be mobilized to justify apartheid. The movement for justice in Palestine is currently reaching a pivotal point worldwide, and queer and trans people have a vital role to play! Whether advocating for change in our communities, working to quash Islamophobia or anti-Arab racism, or working on the Boycott, Divestment, and Sanctions movement, non-Palestinian queer and trans accomplices can make a huge impact in the push for Palestinian liberation. This lecture makes the case for broad queer and trans solidarity with Palestinians from a variety of social justice and historical perspectives, and introduces attendees to the ins and outs of Palestine solidarity organizing. The Boycott, Divestment, and Sanctions (BDS) movement has been a political force since its inception in 2005. Jews, Palestinians, and accomplices around the world have enthusiastically answered the call for solidarity through BDS. A major accusation against the movement is that BDS is antisemitic, and "bad for Jews," however nothing could be further from the truth. 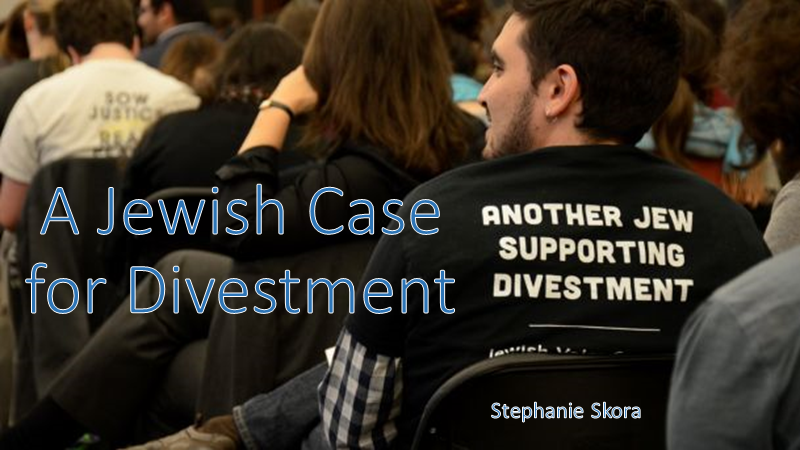 A Jewish Case for Divestment traces the history of European antisemitism, Zionism, and documented Zionist collaboration with antisemites to make a case for BDS as the best method for fighting contemporary antisemitism in the US and around the world.